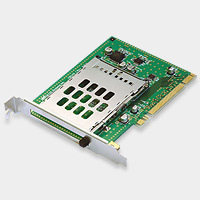 The CBS40U is a PCI to CardBus PC Card Adapter. Supports both 32-bit CardBus PC Cards and 16-bit PC Cards. Allows CardBus PC Cards and 16-bit PC Cards to be shared by both portable and desktop PC. - PCI-CardBus Bridge adapter board. - Supports both 32-bit CardBus PC Cards and 16-bit PC Cards. - Allows CardBus PC Cards and 16-bit PC Cards to be shared by both portable and desktop PC. - Supports both 3.3V Low-voltage 16-bit PC Cards and 3.3V/5V Dual-voltage 16-bit PC Cards. - Automatic detection and configuration both 16-bit PC Card and CardBus PC Card. - Supports Plug & Play and Hot-Swappable 16bit PC Cards, CardBus PC cards. - Supports Wireless LAN 802.11a, 802.11b and Bluetooth PC Cards. - Using the CB31U SCSI CardBus Card, plug & unplug your SCSI device without Restarting. 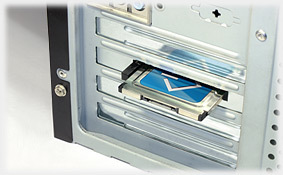 - Add CardBus slot to 1U Server and share SCSI Tape backup streamers with hot swapping. - Supports Panasonic P2 Memory card.